Visitors to Gorontalo no longer have to travel overland. Regular flights now connect Gorontalo with the outside world. Daily flights are available from Jakarta via Makassar (Ujung Pandang) to Gorontalo with Lion Air and Sriwijaya Airlines. In Febraury 2011 Garuda Indonesia opened daily flights to Gorontalo from Jakarta, Denpasar (Bali), Surabaya and Makassar (Ujung Padang). This is good news for those who need to fly on an airline approved by the European Union. Many international flights arrive in Jakarta. Air Asia flies several times a week to Makassar, arriving from Kuala Lumpur late in the evening. Travelers can continue to Gorontalo the next morning. Flights from Gorontalo to Makassar easily connect with Air Asia's return flight to KL. From Manado, Wings Air (a subsidiary of Lion Air) now flies every day, leaving in the evening for Gorontalo. This allows passengers arriving on Silk Air from Singapore to connect. The return flight to Manado is early in the morning, allowing travelers to connect with Silk Air or with flights to other parts of Indonesia. Better yet, tickets for the Manado/Gorontalo flight on Wings Air can be purchased on line at www2.lionair.co.id. If you prefer to travel overland, private transport can be arranged in Manado with a driving time of about 9 hours. Alternatively, you could go by bus; Manado to Gorontalo takes about 10 hours; Fajar Indah is a recommended company. Roads are mostly in good condition, with a few small dirt and rock sections under repair. Your schedule shouldn't be too tight. Sometimes buses are delayed because of flat tires or engine troubles. Better spend at least one night in Gorontalo before moving on by bus or boat. The city is quite pretty, clean and very friendly with beautiful old colonial buildings. Accommodation: Rooms in various categories are available at the New Melati Hotel. Address: Jl. Wolter Monginsidi. Hotel Yulia, Jl. Nani Wartabone (Ex Ahmad Yani) No. 26, also has air-conditioning, cable TV and hot water. Next door is the star-rated Grand Q Hotel Gorontalo (used to be Quality Hotel), considered the most upmarket among Gorontalo hotels. The pioneer diver operator in Gorontalo, Miguel's Diving, has been running seasonally since 2003. Regular dive season is from November to April. Travelers passing through Gorontalo on the way to the Togian Islands can usually work in diving, even during off season. 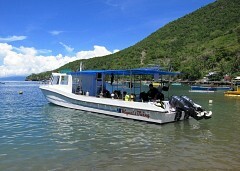 Miguel's Diving uses two custom-built speed boats tied to its private dock and operational center. This set up provides immediate access to the ocean. The dive center is located only a few minutes from Melati, Yulia and Quality hotels. With over 30 sites from which to choose, certified scuba divers can enjoy dramatic coral walls, multiple pinnacles, caverns, muck, shallow coral gardens and two wrecks. One important feature of diving in Gorontalo is the continental wall of Sulawesi, which comes within a few meters of the coastline, bringing deep blue water right to shore. Having some of the most dense and diverse hard coral growth in the Indo-Pacific region, Gorontalo also has a growing list of new, undescribed or endemic species. The huge, surreal Salvador Dali sponges can only be found in Gorontalo. Exchanging foreign currency is difficult in Gorontalo. The notes have to be brandnew, clean and unfolded! Going from Manado to Palu/Central Sulawesi by bus takes around 18 hours. Most travellers prefer the route through the Togian Islands. When crossing Sulawesi from South to North or North to South most travellers now choose for a stopover of at least several days at the Togian Islands. The Togians are a picturesque archipelago of 56 islands and inlets, located in the Tomini Bay. Formed by volcanic activity, the islands are covered by lush rainforest and surrounded by ancient coral reef formations. Both the terrestrial and marine ecosystems teem with exotic wildlife - much of which is extremely rare or endangered. The reefs and coastal areas provide habitat and breeding areas for hawksbill turtle, the green turtle and the dugong. Togian forests and skies are filled with exotic creatures such as the Togian Macaque, the babirusa, the Sulawesi Hornbill, and hanging parrots. Within this tropical paradise, 37 villages provide bright spots of gaiety and culture of several ethnicities, including the Bobongko, Togian, Suluan and the Bajau. IMPORTANT: Be advised that Malaria is a problem in most parts of the Togian Islands. Protect your skin with lots of mosquito repellent; anti malaria drugs are adviced! Dengue fever is also widespread. Currently (January 2012) there are two scheduled trips from Gorontalo to the Togians per week. Don't take them for granted though as boat schedules and frequencies are occasionally changing without prior notice. Check here for the actual schedule and for the most up-to-date info contact Alex Vostrak. You can go by bus from Gorontalo to Bumbulan near Marisa and then with the new ferry "Tunjung Api" to the Togians. This way the boat trip is much shorter - 5h compared to 13h from Gorontalo. There is a ferry from Gorontalo to Pagimana/Central Sulawesi every other evening. From Pagimana by bemo, car, bus or anything to Ampana (4 to 6 hours). Stay one night in Ampana and take one of the boats to the Togians the next morning (none on Fridays!). The Black Marlin Dive Centre can arrange charters from Bunta (half way from Pagiamana to Ampana) in about 2-3 hrs to Kadidiri. Alternatively you can travel to Ampana via Luwuk: from Manado by plane (twice a week: Monday and Saturday) or Pelni ship to Luwuk, then by bus on to Pagimana and Ampana. If you travel this way you can stay for a couple of days at the Tompotika Cottages near Luwuk. Yani and her French husband Jerome are great hosts who can arrange everything for you: from snorkeling, diving and trekking to sailing and trips to Banggai. If you like to do some island hopping on the Togians or you don't have that much time and want so see and do as much as possible, you can try Togian boat trip. They offer various day tours and longer trips. You can go camping at a lonely beach, snorkel at different places, stay in various accomodations, visit local people, go trekking and lots more. The Togian Islands offer the unique opportunity for both divers and snorkelers to explore all 3 types of coral reef: fringe, barrier and atoll. There is a wide selection of dive sites from gentle slope to dramatic drop offs, perfect for beginners and experienced alike with some deeper dives for the advanced diver. Highlights: Atolls (3 in all), Una-Una (active volcano), B24 World War II bomber wreck. Black Marlin Dive Centre is a PADI Dive Centre/Resort at Wakai Cottages/Kadidiri. Rates start from around Rp. 200,000 per person with meals, plus 10% tax. €28,-/ daytime dive, €33,-/night dive. PADI dive courses. Discounts for longer stays. Black Marlin can accept traveller cheques (USD, Euro) and even credit cards (Master, VISA). Mixed reports about the Kadidiri Paradise. A licensed dive instructor is only available for 6 months a year. It's a guy called Gonzag; if he's there it's actually recommended to dive with him. Few mosquitoes here. Pondok Lestari in Kadidiri is a real bargain at Rp 125.000 per night full board, including free boat trips to nearby islands for snorkeling trips. Mostly very good comments about the Fadhila Cottages in Katupat. In Malenge try the friendly Malenge Indah. Ckeck the new Waleakodi Sifa Cottage which offers simple but nice cottages from Rp. 125,000 per person per night with meals and also has a dive center. You can find actual information about boat schedules and other things on their website. They provide you with a free transfer from Malenge harbour. In Bomba you could try the new (December 2014) Bomba Divers. Accommodation nearby at Poya Lisa Cottages. Another option is the Togian Island Retreat. It has a dive center but instructors and divemasters seem to come and go, so better enquire before, especially if you want to do a course. Some people have reported that there are too many dogs and cats at the place. Hardly any mosquitoes, so malaria is not much of a problem here. Some of the Togians' best dive sites are around the volcanic island of Una-Una. And there is a brand new (in 2014) option to stay and dive there, the Finnish run Sanctum Una Una Eco Resort & Dive Center. There is no possibility to exchange money/traveller cheques at the Togians, so take enough cash with you. Some of the dive centers might be able to accept tc's and even credit cards but please check with them before.